As a part of our CasebookPlus offering, you’ll receive the print book along with lifetime digital access to the eBook. Additionally you’ll receive 12-month online access to the Learning Library which includes quizzes tied specifically to your book, an outline starter and digital access to leading study aids in that subject and the Gilbert® Law Dictionary. The included study aids are Contracts in a Nutshell, Exam Pro on Contracts and Acing Contracts. The redemption code will be shipped to you with the book. 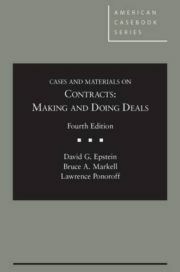 Making and Doing Deals is a book that your students will learn from long after they graduate. It is also a book that should be fun for you to teach from. Its a book that students will enjoy, and, therefore, a book that they will. 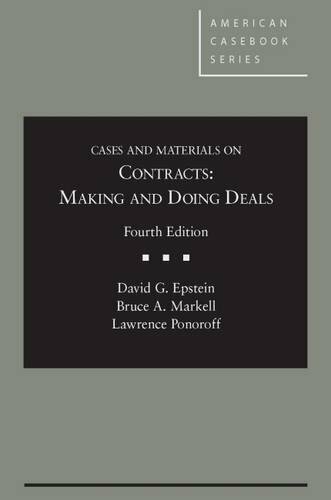 Since the First Edition, students have been reading Making and Doing Deals because the cases, problems, and text not only help them learn what they need to know as first-year law students, but also address the real-world problems and situations they will encounter after their final exam.